Change the Win-7 thousand separator (distinction) and decimal symbol! 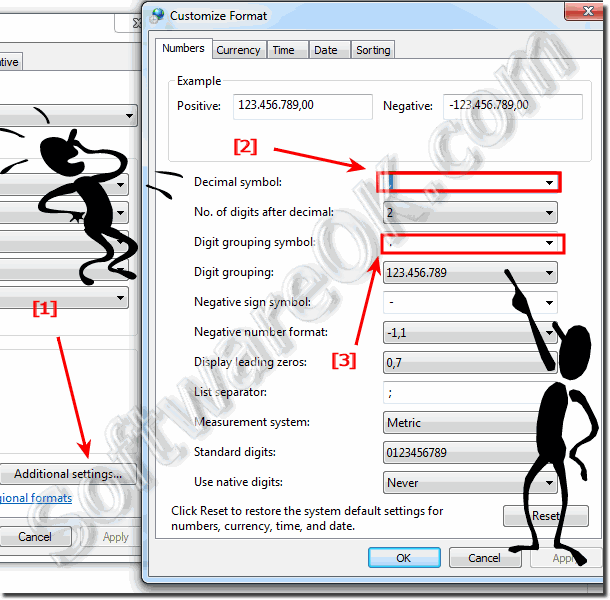 To change the thousand separator (distinction) and decimal symbol in Windows-7! You can change the format Windows-7 uses to display for example dates, times, currency, and measurements. You can also change and customize the sorting order of text to match sorting rules used in a specific country or region on every Microsoft Windows and Windows Server System. This is a short example how to do! Please open the Customize Format Dialog in "Region and Language" settings. and change the thousand separator and decimal symbol in Windows-7! To change the way your computer displays numbers, click the Numbers tab. Items you might want to change based on the format language you choose include the decimal symbol and list separator, the format used for negative numbers and leading zeros, and the measurement system used (U.S. or metric). To change the way your computer displays currency values, click the Currency tab. Items you might want to change based on the format language you choose include the currency symbol, the formats used for positive or negative amounts, and the punctuation used to separate numbers. To change the way your computer displays the time, click the Time tab. For more information about setting the clock, see Set the clock. To change the way your computer displays the date, click the Date tab. If you choose a locale that uses eras to represent dates, then will be used as the notation to indicate an era in the short and long date settings. How to change Display leading zeros on Windows 7 and 10? Customize Negative number format on Windows 7 and 8.1? Change the Decimal symbol and Negative sign symbol settings on Windows, how to? Change Measurement system Country settings on Windows 10 and 7? Customize Standard digits or use native digits on Windows, how to? Windows-7 - FAQ-78: Change the Win-7 thousand separator (distinction) and decimal symbol! How to change Short date and/or Long date format in Windows-7 (10/8.1)? When you want burn a CD or DVD from an ISO file on you Windows-7 OS Insert a recordable CD, Blu‑ray, DVD, or Disc into your disc burner. Rename Default operating system Name at System startup in Windows-7, how to?